The ESP is particularly interested in supporting projects that focus on "heritage and community activities that promote Ireland’s identity and maintain vibrant Irish communities abroad." The many societies across the United States and Canada that partly or exclusively focus on Irish genealogy clearly fall under this remit (see my GSI map to find them all). No doubt, many of them would like to offer more services, transcribe or digitize local genealogy documents, or expand the ability of their members to trace their Irish ancestors. One of the main stumbling blocks to doing this is probably funding. Therefore, I strongly encourage such organizations to consider the ESP as a way to access such funding. The total amount available has increased year-on-year since 2013. The money allocated to organizations in the United States jumped sharply in 2014, the year for which the most recent figures are available (table 1). Of that 3.058m euro that went to U.S. organizations, just under 10% went to those in the cultural/heritage area. However, funding for cultural/heritage organizations increased by almost 29% when comparing 2014 to 2013. Some of the heritage centers that received funding have occasional genealogy events. However, none of the funded organizations have genealogy as a core part of what they do. Only two excellent examples stand out. The Irish American Heritage Museum has a resident genealogist who is available to assist people with their research. The Mission of our Lady of the Holy Rosary Heritage Project in New York City digitized ledgers that are very useful for Irish genealogy research in 1880-1920 New York City and made them freely available online. They received funding in 2014. Capital - Projects involving the construction, refurbishment or purchase of capital assets. This includes projects related to website development/software acquisition. Heritage - Project involving the promotion and maintenance of Irish heritage and identity overseas. Full details of how to apply are available on the website of the Department of Foreign Affairs and Trade. Irish Abroad Unit, Department of Foreign Affairs and Trade. Overview of the Emigrant Support Programme. 2016. https://www.dfa.ie/media/dfa/alldfawebsitemedia/ourrolesandpolicies/theirishabroad/2016-Overview-of-the-Emigrant-Support-Programme.pdf: accessed 23 January 2016. Department of Foreign Affairs. Global Irish: Irish Diaspora Policy. 2015. p. 26. Dept. of Foreign Affairs and Trade. 2014 Emigrant Grant Summary. 2015. https://www.dfa.ie/media/dfa/alldfawebsitemedia/ourrolesandpolicies/theirishabroad/2014-Emigrant-Support-Programme-Funding.pdf: accessed 23 January 2016. Dept. of Foreign Affairs. 2013 Emigrant Grant Summary. 2014. https://www.dfa.ie/media/dfa/alldfawebsitemedia/ourrolesandpolicies/ESP-Funding-2013.pdf: accessed 4 March 2015. Dept. of Foreign Affairs. 2014 Emigrant Grant Summary. 2015. https://www.dfa.ie/media/dfa/alldfawebsitemedia/ourrolesandpolicies/theirishabroad/2014-Emigrant-Support-Programme-Funding.pdf: accessed 23 January 2016. No location information was provided in the Grant Summary document. The only organization with this exact name is in Seattle, WA. There is also the 'Irish Heritage Club of Bakersfield' in California. Disclosure: this genealogist is Lisa Walsh Dougherty who has written posts for this blog. This review contains plenty of spoilers, although the focus is more on the records used in the show than the stories. The most recent episode (Tuesday, 12 January 2016) of Finding Your Roots was stylized as the Irish Factor, as it featured Bill O'Reilly, Bill Maher, and Soledad O'Brien. If the title isn't enough of the clue, their second names leave you in no doubt that this episode focused on researching Irish ancestors. Bill O'Reilly was born on Long Island, New York and his ancestor, Irish-born great-grandfather John O'Reilly, was a part of the storied Irish immigration to New York City. A huge part of finding where your ancestors are from in Ireland depends on when they immigrated to the U.S. Luckily for O'Reilly, his immigrant ancestor was born after 1864. By that year, civil registration of birth records began in Ireland and almost every Roman Catholic parish maintained baptismal registers. In the show, a brief clip is shown of an Irish civil birth record, showing his great-grandfather's birth in 1868 in County Cavan. Moving forward one generation, World War I records, in the shape of John O'Reilly's (son of John O'Reilly, immigrant from Ireland) military file and a letter written by an infantry colonel, shed light on the activities of O'Reilly's grandfather, including that he fought in the Battle of the Argonne Forest. The show's researchers were unable to find the place of origin in Ireland of Bill Maher's paternal immigrant ancestors, who ended up in New Jersey. Presumably, every record found for them just mentioned Ireland as a place of origin. Instead, they focused on his maternal lines with one of my favorite record sets, that of the Emigrant Industrial Savings Bank in New York City, pointing the way home to Killury, County Kerry, for his ancestor Denis Greany. Soledad O'Brien's Irish ancestry was particularly interesting, in that her father was born in Australia to descendants of people who left Ireland for the Antipodes. The show highlighted just how good Australian records can be. An 1884 marriage record showed that her great-grandfather Patrick O'Brien was from Miltown [Malbay], County Clare and her great-grandmother Ellen Fitzgerald was from Bantry, County Cork. The names of their parents were also included. A newspaper obituary was also used to show the death of Patrick O'Brien. What was not highlighted was that the obituary also contained the detail that he was from Miltown Malbay, County Clare. The debt owed to Richard Griffith by the descendants of every mid-19th century Irish person was again highlighted as O'Brien's paternal ancestor, Anthony O'Brien, was found in the Doonsallagh East townland, County Clare. After talking about O'Brien's Irish ancestry in Australia, the presenter of the show, Henry Louis Gates, began to discuss how difficult it would be to find where her ancestors were from in Ireland. It was unfortunate that he said "the vast majority of Ireland's records were lost in the early 20th century. By and large, all that remain are Church and county records." Obviously, a lot of very important records were destroyed during the Irish Civil War in June 1922, but it was not the vast majority. Also, there are practically no Irish genealogy records that are created at the county level. It is also usually easier to trace back to Ireland from Australia when compared to the United States. Therefore, it might have been better to highlight this difficulty, with, for example, Bill Maher's paternal linage. When it was found that Ellen (Fitzgerald) O'Brien was born in Bantry, County Cork to Michael Fitzgerald and Hannah Sullivan, it was stated that no more information could be found about her. This was surprising, considering she was born about 1858, which is not that early. Even though the names are common, a quick look at the Roman Catholic records for Bantry on irishgenealogy.ie turned up her baptism. Despite these quibbles, it was a very good show. A lot of information and records were covered in 52 minutes and it is a good episode to watch for those at the beginner to intermediate level of genealogy research. You can watch the episode on the show's website (US only). Bantry Roman Catholic Parish, Cork, Ireland, Baptisms, Ellen Fitzgerald, 20 December 1857; digital image, Irish Genealogy http://churchrecords.irishgenealogy.ie/churchrecords/details/2b5b000016549 : accessed 16 January 2016. Dr. Terrence M. Punch, FIGRS is the expert when it comes to genealogy research in maritime Canada (the provinces of Nova Scotia, New Brunswick and Prince Edward Island). Since the 1970s, he has published numerous books on Scottish, Irish and French immigration. Of particular interest to this blog is his series of books concerning Irish immigrants to Canada. "Canada Maritime provinces map" by QuartierLatin1968 - user created. 2012. 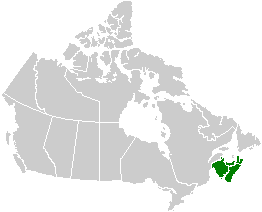 Licensed under Public Domain via Commons - https://commons.wikimedia.org/wiki/File:Canada_Maritime_provinces_map.png#/media/File:Canada_Maritime_provinces_map.png: accessed 9 January 2016.